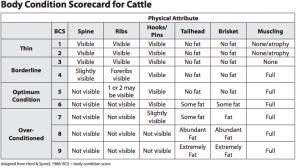 Body condition scoring is one of the most valuable management tools at the disposal of the cattle manager. This one number gives producers a direct indication of an individual cow’s previous plane of nutrition and future reproductive capability. Although the individual body condition scores are important, we don’t necessarily manage individual cows, we manage groups of cows. Thus, it is important for us to look beyond the individual scores and look at the distribution of body condition scores within the herd. If we have a herd (Herd 1) with an average body condition score of 5 that is essentially characterized by the classic bell curve, with a few thin cows (3.5’s), the bulk of cows in the middle (4’s and 5’s) and few over-conditioned cows (7’s) everything is good. Alternatively, we could have a herd (Herd 2) with an average body condition score of 5 that is essentially the result of a few thin cows (3’s) and some over conditioned cows (6’s and 7’s). Body condition scoring also has more value when it is done on the same group of cows at multiple times during the production year. If Herd 2 was scored at calving and had been previously scored at weaning and had an essentially normal distribution (similar to Herd 1), we need to ask ourselves what happened. Did we change anything? Although these examples are somewhat extreme, they illustrate that we have to look beyond the individual body condition scores of cows at one point during the production year to get the most of body condition scoring. 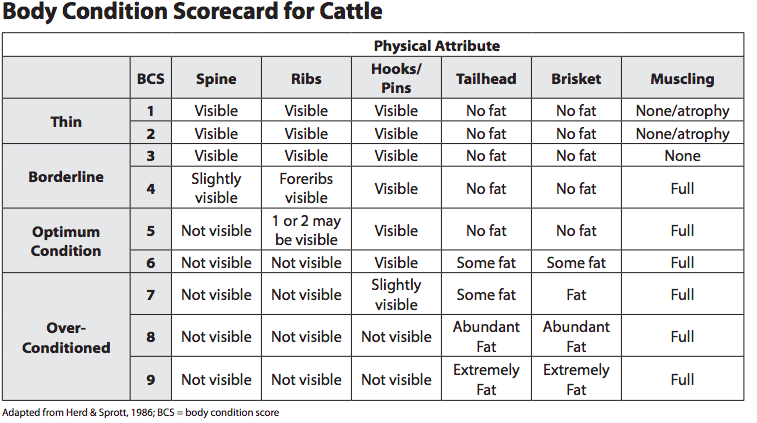 K-State has several resources on body condition scoring available on the web that may be accessed at https://www.asi.k-state.edu/research-and-extension/beef/feedandwater.html, including the quick reference guide to body condition scoring shown below. Many locations in Kansas have experienced wet conditions this fall. Thus, I thought this article by Chris Reinhardt, former Extension Feedlot Specialist, was worth sharing. Consider the humble Box Blade — As a feedlot nutritionist, you’d think my favorite piece of equipment or technology would be the steam-flaker, the feed mixer, or the small-ingredient inclusion system. No. I love the box blade. Why? Because the nutritionist owns performance. BRD belongs to someone else, but when closeouts are chronically below expectations, the nutritionist often takes the heat. As we come into a wet winter, lots can become muddy, and mud has devastating impacts on performance. Cattle need a (relatively) dry, comfortable place to lie down. If excessive moisture has resulted in destruction of the mound, it’s time to run the box blade. Cattle that cannot rest do not perform. Cattle should have 20-25 square feet of mound area on which to lie down. The top surface (5-10 feet wide) of the mound should be crowned side-to-side, and longitudinally the mound should also have a mild grade similar to the direction of the general slope of the pen, which is normally between 1 and 6%. The sides of the mound should have a slope of 1:5 to enhance drainage yet still allow cattle to lie on the surface. The end of the mound should connect directly to the concrete bunk pad so that, especially during muddy conditions, cattle can move freely and easily between the mound and the bunk and water areas. This will encourage both feed consumption and resting behavior, both of which will enhance performance during and after inclement weather. The basic components that nutritionists need to evaluate a feedstuff or develop a ration are dry matter or moisture, crude protein, an estimate of the energy content of the feedstuff (Total Digestible Nutrients (TDN)), Net Energy for Maintenance (NEm), Net Energy for gain (NEg), and the macro minerals, Calcium and Phosphorous. These are the most basic numbers that are required, but including some additional analyses in the report can give us additional insight into the quality of the feedstuff or improve our ability to predict animal performance, which is the primary reason we analyze feedstuffs. I recommend that the report include acid detergent fiber (ADF) and neutral detergent fiber (NDF). The amount of NDF in forage reflects the amount of cell wall contents (hemicellulose, cellulose and lignin) within the sample. The NDF fraction is often associated with the respective bulkiness of forage and is correlated with dry-matter intake of the forage or feedstuff. Therefore, the amount of NDF may be used to estimate the expected dry-matter intake associated with the forage. The ADF number represents the amount of cellulose and lignin within the forage and is correlated with the respective digestibility of the forage. In general, a higher ADF value is associated with forage that has a greater proportion cellulose and lignin and would likely be more mature. Additionally, the ADF fraction is used to calculate the energy estimates TDN, NEm, and NEg that appear on the report. There are a number of different mathematical equations that the testing laboratory may use to calculate these numbers, based on the type of sample (corn silage, alfalfa, grass hay, etc.). If the ADF is included in the report, the nutritionist can adjust or recalculate the energy estimates if necessary. Most analytical laboratories have a number of different analysis packages which encompass the most common procedures or numbers that a nutritionist or producer needs to know about their feeds. These packages will typically include the basic procedures (DM, CP, TDN) and then add on specific analyses such NDF, or the Macrominerals (Ca,P, Mg, K, Na, Cl, S). Some laboratories may group analysis packages by the type of sample (forage vs. mixed ration) or production purposes (dairy vs. beef). The objective of analytical testing of forages and feedstuffs is to improve our ability to meet the animal’s nutrient requirements and ultimately predict animal performance. The unequivocal best method of evaluating the quality of a feedstuff is feeding the feedstuff to an animal and evaluating performance over a set period of time, under a specific set of conditions. Since that would not be cost effective or timely, analytically evaluating feedstuffs in a laboratory is the next best thing and although it is not perfect, it is unequivocally better than the “this looks like really good stuff” method of evaluating feedstuffs. Vaccine and antimicrobial technologies continue to improve at a breakneck pace. Yet we continue to see that calves that are unprepared for life in the feedlot and which undergo significant stress during and after weaning en route to the feedlot will have morbidity upwards of 30% and first treatment success is often only about 50%. Calves that get mild respiratory disease in the feedlot will have 0.2-0.4 lb. lower ADG and those calves requiring multiple treatments for respiratory disease will gain 0.6 lbs less for the entire feeding period. This translates to about 15 lb. less carcass weight and 10-15% fewer choice carcasses. It pays to keep calves healthy. Preconditioning can mean different things to different people, from giving calves a single vaccination prior to weaning, all the way up to two full rounds of vaccination, before and after weaning, weaning the calves from their dams for 45 to 60 days, and transitioning the calves onto a total mixed ration, eating from feedbunks, and drinking from waterers. As far as animal performance is concerned, the extent of preconditioning needed to minimize problems at the feedlot and maximize feedlot performance depends on the extent of stress imposed on the calf during transition. Studies at K-State suggest that single-source calves shipped four hours to a feedlot will benefit from preweaning vaccination, weaning and feeding for at least two weeks before shipment to the feedlot. However, if calves are going to be shipped more than eight hours from home, they will be commingled with other sources of calves either in transit or upon arrival at the feedlot, and are likely to experience adverse weather conditions during the transition period to the feedlot, vaccination and weaning for six to eight weeks before shipment would be preferred. Investing time, technology, and labor into the calf crop has very real costs for the rancher. But the high purchase price of weaned calves entering the feedlot means the financial risk of respiratory disease and the uncertainty that respiratory disease causes feedlot producers has very real costs as well. Many feedlot producers are willing to pay ranchers a premium to mitigate some of the disease risk that causes the feedlot economic uncertainty — consider it “biological risk management.” When certified preconditioned calves are sold at special preconditioned calf sales, they have the potential to bring significant premiums over non-preconditioned, “commodity” calves. Respiratory disease is the most costly disease in the cattle industry, and the greatest factor affecting calf performance in the feedlot. If you can prevent or control disease, you can, to a certain extent, control performance of calves. Feedlots are paying premiums for calves that are prepared for life at the feedlot. Why? Because they perform and are predictable — predictability is the opposite of risk. As a rancher, you can and should be paid for your investments of time, money and management. For more information, contact Justin Waggoner at jwaggon@ksu.edu. The K-State Focus on Feedlots has many uses. Foremost, it provides many of us that are not directly connected with the cattle feeding industry a means of staying abreast of cattle performance and closeout data from commercial feeding operations. Additionally, the data generated may be used to build economic budgets for cattle producers considering retaining ownership or placing a group of cattle on feed. 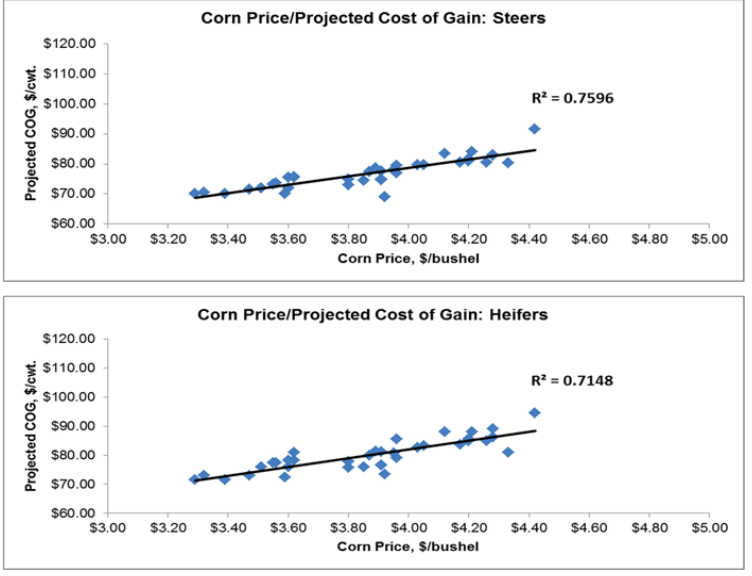 One of the common questions that come up in these discussions is “what the projected cost of gain will be?” One of the simplest ways to estimate placed cost of gain is to look at the relationship between reported corn price and reported projected cost of gain for steers and heifers. The data obtained from the Focus on Feedlots from 2015, 2016, and 2017 is shown in the graphs below. The relationship between corn price and placed cost of gain is expressed in the following formulas: Projected Steer Cost of Gain ($/cwt) = $22.32 + ($14.09 x Corn Price). Projected Heifer Cost of Gain ($/cwt) = $21.16 + ($15.21 x Corn Price). 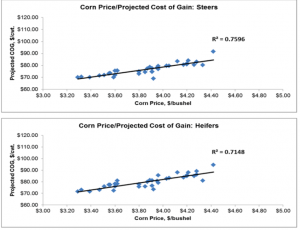 These formulas may be used to forecast the projected cost of gain if corn price is known. For example, when corn is $3.50/bushel, cost of gain for steers equals $71.64/cwt ($22.32 + $14.09 x $3.50). Based on this formula, cost of gain will increase $14.09/cwt for every $1.00 per bushel increase in the price of corn. The incremental cost of gain for heifers is slightly higher ($15.21 vs. $14.09) for every $1 per bushel increase in the price of corn. The table below lists the projected cost of gain at various corn prices from $2 to $7 per bushel. The intercept values ($22.32 and $21.16 for steers and heifers respectively) reflect other costs associated with feeding cattle (e.g., labor, equipment, and facilities). There are many factors that influence cost of gain, primarily cattle performance (ADG, feed conversion. etc.) which is not necessarily taken into account with this method. However, this does provide a simple method that can easily be adjusted up or down to fit specific groups/types of cattle and expected weather conditions during the feeding period. For more information, contact Justin Waggoner at jwaggon@ksu.edu. Most cattle operators view open cows with some degree of disappointment. However, you might be surprised at the amount of revenue that can be realized from cull cow sales. I recently summarized the Kansas Farm Management data on Kansas cow-calf operations from 2010-2015. Participating operations had an average herd size of 126 head, weaned an 84% calf crop, sold 106 calves and 20 head of breeding stock or cull animals annually. In the 2015 data, the average gross income of participating operations was $118,710, the sale of breeding stock or culls generated $28,453 of that figure. Thus the sale of cull animals accounted for 24% of the participating operations gross income. Although marketing cull breeding stock/cows is often viewed as a loss, it is a significant source of income that should not be overlooked. Most cull cows are sold through local auction markets. Therefore, understanding the market and making timely marketing decisions is one of the most important components of realizing the most dollars out of a cull cow. 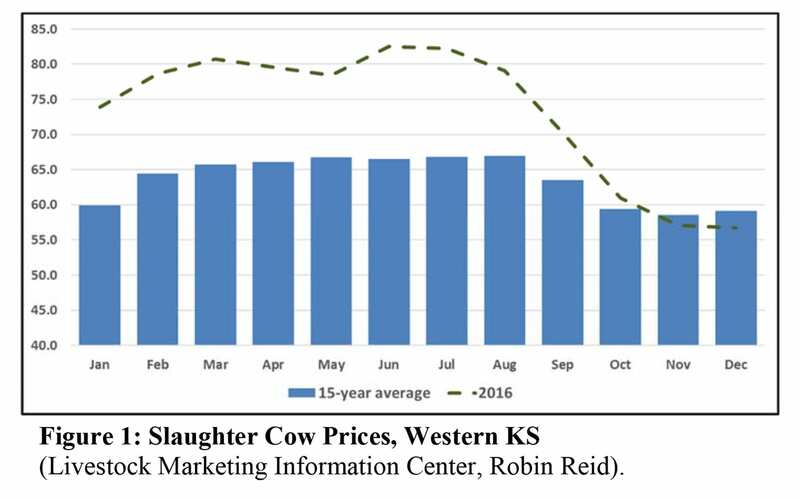 The figure below illustrates the 15-year average and 2016 slaughter cow prices in Western Kansas. 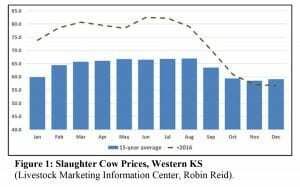 Slaughter cow prices tend to be highest and relatively steady from February to August, and then decline rapidly, being lowest in the months of October, November and December. Essentially, the worst time to market a cull cow based on the seasonal nature of the market aligns with pregnancy determination and weaning on most spring-calving operations. Therefore, if open cows are identified in late summer and are in good condition, marketing those animals as soon as possible would likely result in a higher price than waiting until later in the fall. If open cows are identified later in the fall, deferring marketing until late winter/early spring and placing cull cows on low-input feeding program that would add additional weight and condition (provided resources are available) might be more advantageous than marketing those animals immediately. Each year I retrospectively summarize the data from the K-State Focus on Feedlots in an effort to document annual trends in fed cattle performance. The Focus on Feedlot data for heifers from 2017, 2016 and 2015 is summarized in the table below. Overall, the number of heifers marketed increased in 2017 with approximately 8,400 more heifers being marketed in 2017 than 2016. Heifer in weights were lower, averaging 729 lbs in 2017. Final weights of heifers were on average 30 lbs lower in 2017 at 1,252 lbs, compared to 1,282 lbs in 2016 and 1,266 lbs in 2015. Heifer days on feed increased to 160 days, an increase of 6 days relative to the 154 days reported in 2016. Heifer average daily gain and feed conversion was similar across years. Death loss increased to 1.64% relative to 1.46% in 2016, but was similar to the 1.62% reported in 2015. Total cost of gain for heifers was $3.17/cwt lower in 2017 than 2016. Heifer cost of gain was $3.76/cwt greater on average than that of steers, $74.34/cwt versus $78.10/cwt.